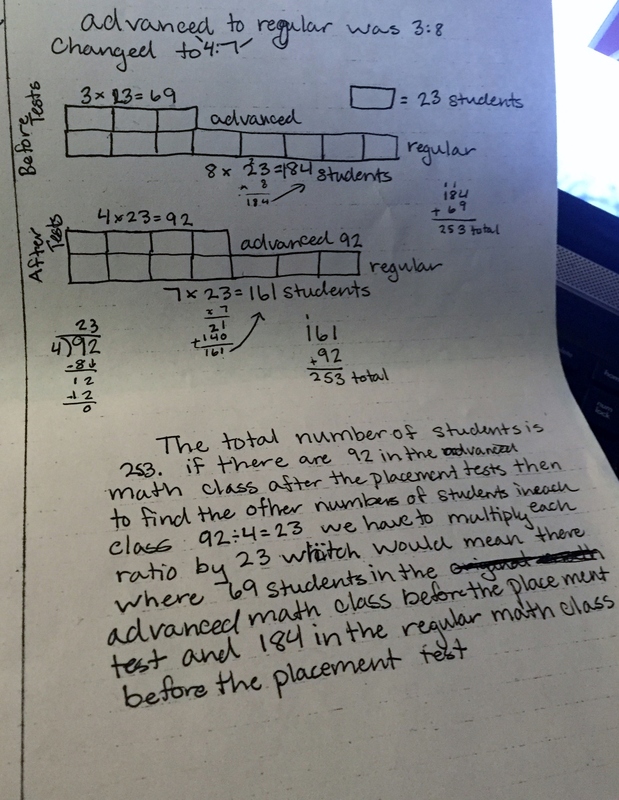 One of my goals this year, is to have students reflect on their ability to use the math practices efficiently in order to make sense of the mathematics. As I thought about the most beneficial strategies of engaging in reflection, I realized that before students engaged in reflection, they needed to be comfortable analyzing others’ work against some “look fors” This would help students create a basic idea of the practice from which ongoing meta-cognition of their own work could develop from. I felt that if they had a clear understanding of how to analyze others’ work, they would internalize the practice and incorporate it into their work. My next step was to research and create the “look fors” for each math practice and group them onto rings. Our learning target, all week, had been to be able to make models in order to make sense of proportional relationships. 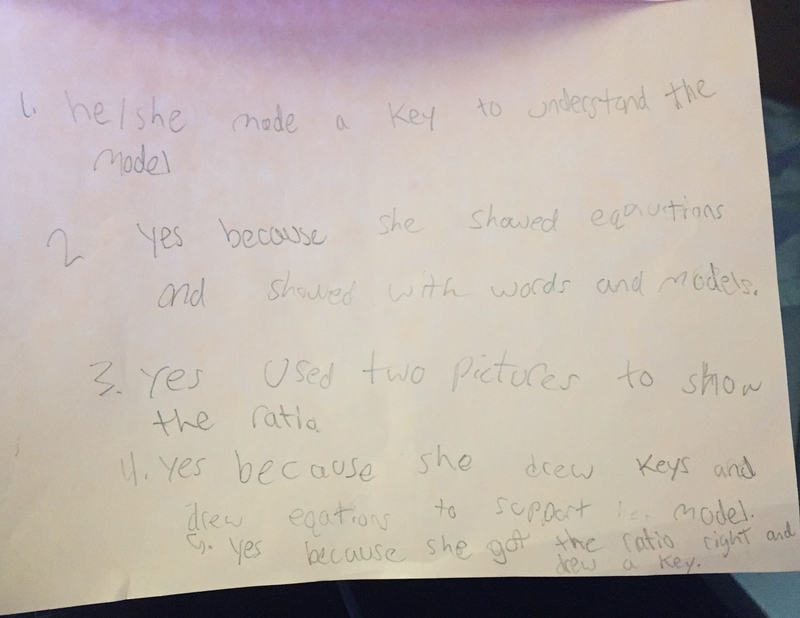 As such, I asked them to focus on the “look fors” for Math practice 4: Model with Mathematics. Day 1: Each student completed one of three ratio problems(see below for link) and put work (without name) into designated area for that task. After school, I selected four student work samples for each problem, some showing logic with explanation and others with underdeveloped models. A student work sample from one of the tasks given to students. 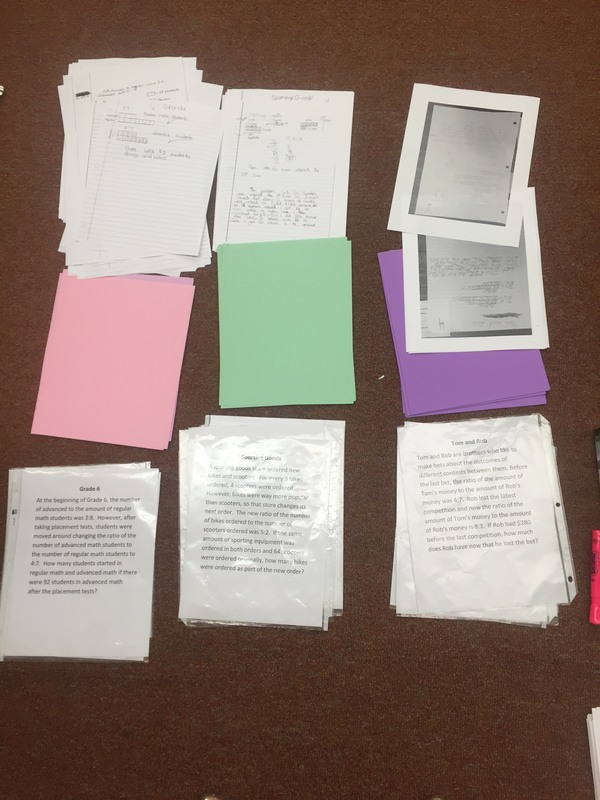 Day 2: Students got an original task (the one that they already had worked on the previous day), sample student work from one of their peers, math practice “look fors” and a paper (colored to the task) for writing their analysis for student work. 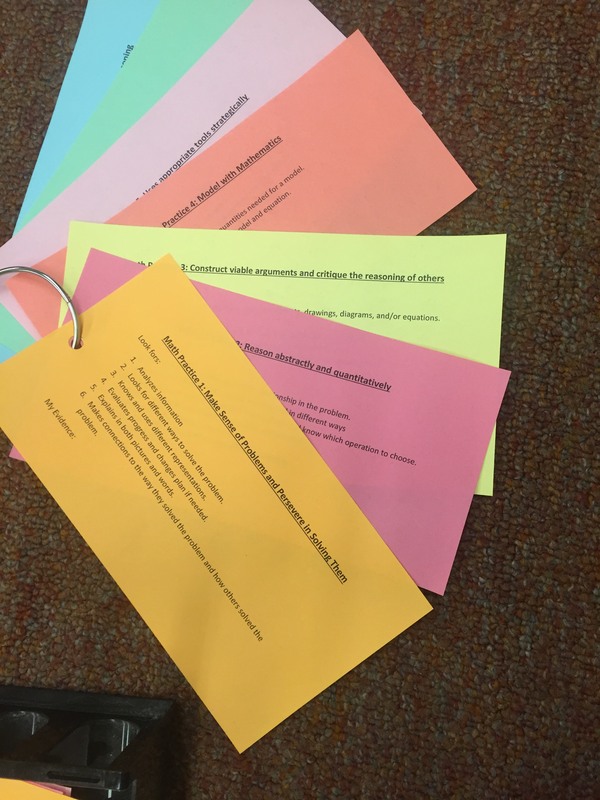 Three tasks, student work sample, and colored paper for reflection. 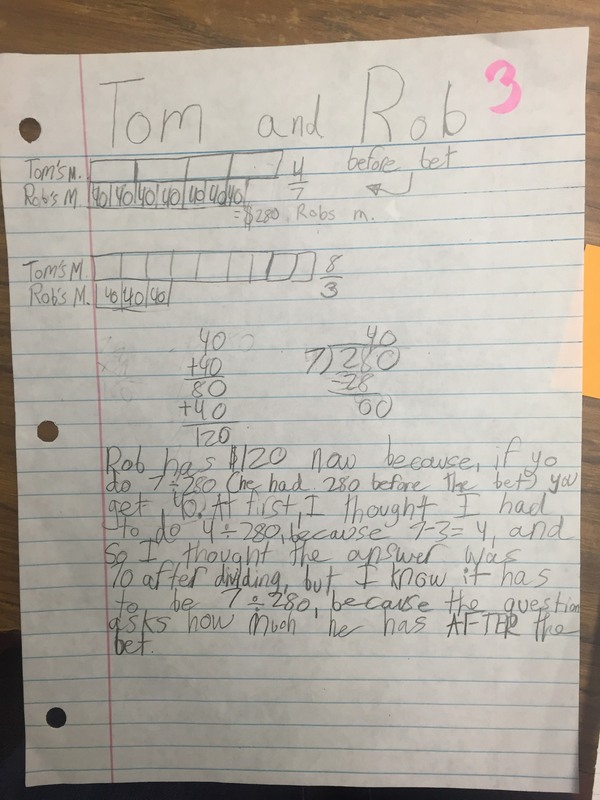 Students then took the “look-fors” and identified where they found or didn’t find evidence of math practice #4, in the student work. They were instructed not to focus on the answer, but rather the use of the model and its ability to determine and justify the solution. Student finding evidence of each of 5 look fors. 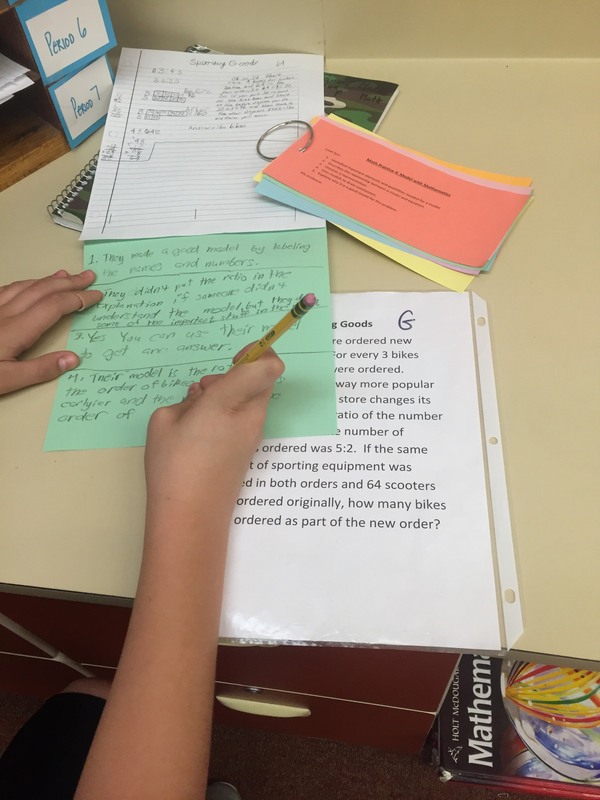 Students attempted to look for evidence of all five criteria in the work. If they thought it was underdeveloped, they were to express why and what the author could have done to make their model(s) clearly show their mathematical ideas. Students had trouble with some of the language in the look-fors (ex. Draw a conclusion). I determined that if I wanted the process to be one of analysis, then I needed to change the language to be easier to interpret. My revisions, in rough form. A new one will be revised from this. However, I also noticed that students did not have an ability to reflect on other students’ work. This simply was not a practice they had employed before. Since analyzing is a high cognitive demand task, I plan on doing one of these lessons (potentially two) for every math practice to help deepen critical thinking among the students. Goal: Eventually after having multiple opportunities to explore with the math practices, in a context that makes sense to them, I would like students to generate their own look-fors for each practice. Deepending their understandings of the practices and connecting to to successful mathematicians. Encouraging students to give critical feedback to others in an objective way, will help grow their individual and collective strengths.